Skeuomorphism is a Greek term that refers to a design or structural element that is used ornamentally where it previously served a functional purpose. Skeuomorphs can be deliberately used or may be the result of subtle cultural influences on design. A common example is the use of an envelope icon to represent emails. In terms of construction, common skeuomorphs include the use of plastic to resemble timber, and the use of vinyl sheets that are designed to resemble timber or stone flooring. One of the earliest examples comes from Greek architecture, when construction made the transition from timber to masonry. Many Greek timber buildings featured ceiling rafters which would protrude from the top of the exterior. When starting to build with stone, the architects carved details that were intended to mimic the protruding rafters. Instead of serving a functional purpose, the intention was purely to provide a familiar aesthetic. 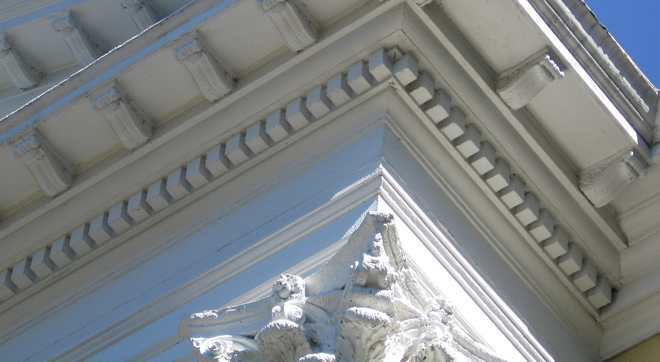 In later years, Roman architects adopted the stone protrusions and called them dentils which can still be found in contemporary buildings.